Under the railway arches of a central London bar ROLI — makers of the acclaimed Seaboard instruments — took a big stride forward last night. At an Apple-esque launch event, the rapidly growing Dalston-based music technology company unveiled a brand new music creation system: Blocks. Part Launchpad, part Seaboard, part Lego; the company's latest, and suitably well-engineered product is actually trio of devices. Perhaps the most exciting new piece of gear is the Lightpad Block: a square, RGB backlit block (for want of a better word) with a firm but supple playing surface that responds to ROLI's 'five dimensions of touch' like the company's much more expensive Seabord instruments and controllers. The blocks can be joined together for data transfer and charging via a proprietary magnetic connection not dissimilar to Apple's MagSafe or Korg's LittleBits, to create a larger, modular music creation and performance system. When a new device is clipped in, it is automatically recognised and added to the current system. The blocks are designed to work with ROLI's free NOISE app, which gives the user a plethora of playing options, ranging from clip launching, drum pads, through to Ableton Push-style melodic playing. This is where the Blocks really come into their own — distilling the power of the Seabord into a much more portable and affordable controller. Add to this quantised scale and chord modes and an arpeggiator, and (if you're already an iOS user) this could well make it on to the Christmas list for a fair few music technologists. There are all sorts of sonic manipulations that can be applied to the grooves produced in the new, free NOISE app. Hit an area in drum pad mode then slide it around to alter the pitch, or apply pressure to adjust the repeat rate. Play a pitch-bend heavy synth solo expressively over three octaves on a playing surface that gives back a lot more than the featureless glass of a smartphone. All the Blocks (more on the others shortly) can communicate via Bluetooth MIDI and MIDI over Wi-Fi. Although ROLI claim the wireless technologies sport very low latencies, those with a specific allergy to any latency at all will be able to connect via USB. The Lightpad Block can be used like a regular MIDI controller as well with the option to use it in various different grid modes and also as a single XY-pad. It's unique selling point here is, of course, the addition of MPE (Multidimensional Polyphonic Expression) which gives it a further dimension of control. It’s hard to think of another product that gives you an MPE MIDI controller for less that £200. The other Blocks are the Live Block and the Record Block which break out relevant controls from the NOISE app on to highly-visible banks of backlit buttons. As you’d imagine, these arrangements allow quick access to oft-used performance and production features. One of the more interesting features is the Learn mode which guides you through each sound in the app in such a way that demonstrates the potential of each particular patch. Performances can also be captured and shared — each performance being visualised by a series of light traces that can be later followed. CEO Roland Lamb mentioned a new collaborative online platform (likely built by the recently acquired Blend.io team) called NOISE.fm which will undoubtably offer more and more tutorials over time for everyone from your mate Dave to big-name artists. That's the breadth of audience that the new Blocks system is aimed at: everyone with even a passing interest in music making right through to the professional artist who will create huge, modular setups for live performance. And, in the hands of the latter, early signs are that it has the potential to be a really powerful music tool. Keep your eyes peeled for a full review in an upcoming issue of SOS. Here's a demo of the Blocks system in action. 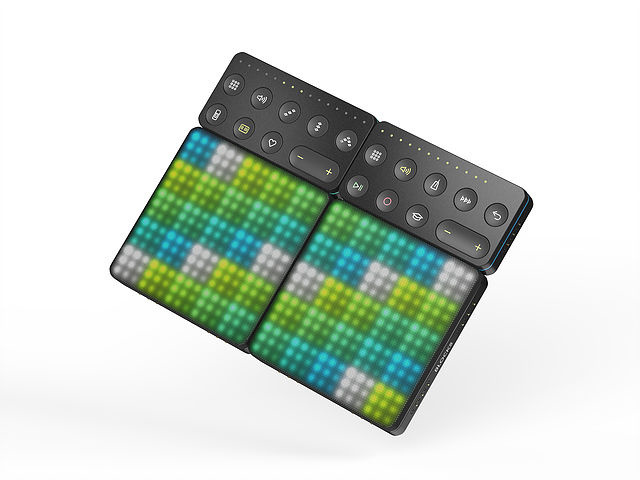 The Lightpad Block, Live Block, and Loop Block are exclusively available at ROLI.com, Apple.com, and Apple Stores around the world. With a Lightpad Block retailing at $179 (£169.95) and the Live Block and Loop Block at $79 (£69.95).